It doesn’t take much for me to rev up my built-in time machine and transport myself back to the late 1960s and early ‘70s and the halcyon days of Darby Dan Farm. In this case, the catalyst was the death this week of Loyd “Boo” Gentry, who trained the ill-fated phenom Graustark and 1967 Kentucky Derby winner Proud Clarion. Boo was the nephew of long-time Darby Dan farm manager Olin Gentry, the rough n’ tumble hardboot who had ridden in Mexico during the time of Pancho Villa and who had built Col. E.R. Bradley’s Idle Hour Farm into a dynasty. Darby Dan had hit a dry spell on the racetrack in the mid-60s after winning the 1963 Kentucky Derby and Belmont Stakes with Chateaugay and seeing their brilliant champion Primonetta win 17 of 25 starts from 1960 to ‘62. In 1965, Boo Gentry was training the Darby Dan babies at St. Lucie training center in Florida (now Payson Park). Among the group was a magnificent-looking liver chestnut by Ribot, out of Flower Bowl named Graustark, who showed right away he was something special, tearing up the track in the mornings. One day, their main trainer, Jimmy Conway, went down to see the 2-year-olds, but was never shown Graustark. When Darby Dan owner John W. Galbreath sent a string to Chicago with Gentry, Graustark went with him and began rattling off one spectacular victory after another. An outraged Conway confronted Galbreath, telling him he believed Boo and Olin had conspired to hide Graustark from him, although he had no way of proving it. Galbreath claimed he was unaware of any secrets being kept from Conway and that he was never told there was anything special about Graustark. He offered to turn Graustark over to Conway, but the veteran trainer said he felt guilty forcing Galbreath to move the colt. He felt his only recourse under the circumstances was to resign. Gentry took control of the main string of Darby Dan horses, and by the following winter, Graustark had become the shortest-priced Kentucky Derby favorite ever in the Caliente Future Book. Gentry trained him hard and often, feeling he could handle it, and Graustark, despite various physical setbacks, kept winning off by himself under wraps in fast times. His Florida campaign was cut short by a heel bruise after he demolished the speedy Impressive in the Bahamas Stakes. Impressive was so fast, he easily defeated his illustrious stablemate Buckpasser that winter going seven furlongs. 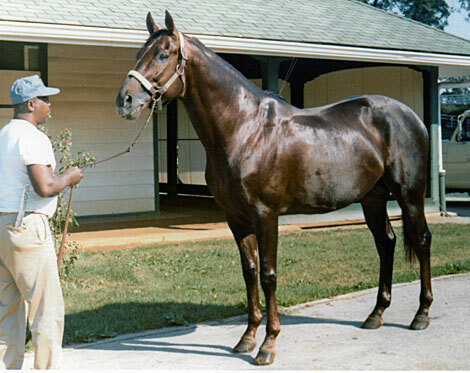 Buckpasser would go on to win his next 15 starts. Graustark was forced to miss the Everglades and Flamingo and was put away and pointed for the Blue Grass Stakes. Gentry began taking heat about the way he was training Graustark, who was now known as “The Big G.”. The day before the Blue Grass, Graustark blew out three furlongs in the slop in :33 4/5 and returned lame. Gentry blamed it on the blacksmith putting the nail in wrong and announced he would still run Graustark in the Blue Grass. He admitted it was a gamble, but said he had to take the chance if he was going to have Graustark fit enough for the Derby. Galbreath was never one to interfere with his trainer and decided to trust Gentry’s judgment and go along with his decision. In the Blue Grass, Graustark opened a huge lead under Braulio Baeza, but started to bear out. Because the colt needed to be tested to get ready for the Derby, Baeza was told by Gentry to let the others close in on him and then ask Graustark for his run. Abe’s Hope closed the gap at the quarter pole and got a good half-length lead in the stretch before Graustark came charging back at him, only to fall a nose short. It was his first career defeat. After the race, it was discovered he had fractured the coffin bone in his left front foot and he was retired to Darby Dan Farm in Lexington, Ky. The injury likely occurred when Graustark was asked to go from a pull to a drive in a matter of a few strides. Graustark was Gentry’s first big horse and the pressure he was under in Florida and Kentucky was intense. The next year, Gentry had a colt who was virtually unknown until a second-place finish in the Blue Grass Stakes. Proud Clarion would go on to win the Kentucky Derby at odds of 30-1 in an odd twist of fate for Darby Dan and Gentry. Graustark would become the pride of Darby Dan Farm and one of the most influential stallions of his time and a major source of speed, class, and stamina. The winter and spring of 1969 was an exciting time at Darby Dan, with most of the excitement being generated by Graustark’s yearling full brother, a grand-looking son of Ribot – Flower Bowl. The night the colt was born, everyone on the farm was beaming over the birth of this handsome bay colt. But the following morning, Flower Bowl began to hemorrhage, and all efforts to save her failed. 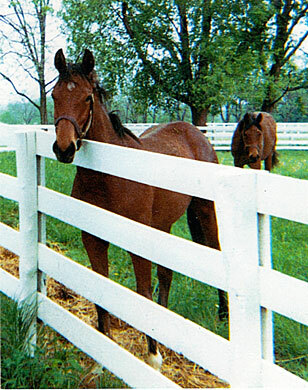 The foal was raised by a nurse mare and placed under close scrutiny by Olin Gentry. When it came time to wean all the youngsters and place them in a paddock together, Gentry realized he couldn’t risk injury to Graustark’s brother. He was too valuable a prospect, so Gentry put him in his own small paddock right next to the yearling barn. But horses are social animals, and Gentry knew he had to find a yearling with an easy-going temperament to serve, not only as paddock mate, but a calming influence on the feisty Ribot colt. He chose a son of Hail to Reason, out of Polylady, and the two of them hit it off immediately. I had the good fortune of visiting them in the winter and again in the spring. Olin and I and my friend Fred had become pretty close and we would spend almost all our time at the farm whenever we visited. Olin was often crusty and cantankerous, but he either took a liking to us or was amused by these two wimpy city boys hanging out at the farm. Armed with my trusty Kodak Instamatic camera, I took numerous photos of the two yearlings, one of which actually appeared in the Morning Telegraph and another in the Daily Racing Form years later. One showed the two colts standing nose to nose, nuzzling each other, and the other was of them both up on their hind legs wrestling, with the Ribot colt’s front legs up on the Hail to Reason colt’s shoulders. He was the dominant one and that was just fine with his pal. It was apparent the two of them had become the best of friends. But as anyone who works on a farm knows, friendships are fleeting. By mid-summer, the carefree life was over, as the yearlings were sent to the Columbus, Ohio farm to be broken. The two colts now had other things on their mind and both learned their lessons quickly. The following year, the Ribot colt, now named His Majesty, was sent to trainer Dave Erb at Belmont Park, while the Hail to Reason colt, now named Good Counsel, was shipped to Darby Dan’s European trainer Vincent O’Brien in Ireland. Soon after, longtime assistant Lou Rondinello replaced Erb as trainer, and could tell right away that His Majesty was something special. The colt had grown into a magnificent athlete, who showed great promise in the mornings. After breaking his maiden by five lengths in his second start at 2, he was shipped to Hialeah where he scored an impressive victory in an allowance race. Then came an incredible performance in the seven-furlong Bahamas Stakes, in which he finished third, beaten a half-length by Graustark’s son Jim French, after being forced into the rail and stumbling badly. Following a gutsy head victory over Jim French in the 1 1/8-mile Everglades Stakes, in which he barely snuck through a tiny opening along the rail, His Majesty became one of the early favorites for the 1971 Kentucky Derby, along with Hoist the Flag. But in the Flamingo, he once again got stuck down on the inside and again hit the rail, finishing sixth behind Executioner. The following day, X-rays revealed a chip fracture in the right front pastern. Like his brother, he had lost his chance to run in the Kentucky Derby. Following surgery, he was sent back to Darby Dan to recuperate and did not return to the races for nine months. Meanwhile, Good Counsel, had finished second and fourth in his two starts in Ireland. With His Majesty on the sidelines, it was decided to send Good Counsel back to America, where he won three of his first four starts before finishing third in the Travers Stakes and winning the Rosemont Stakes at Delaware Park. When His Majesty returned in December, it took him several races to get back in top form. Now reunited, His Majesty and Good Counsel were sent to Santa Anita, where they ran well, but never really took to the hard surfaces. Then it was on to Hialeah and the 1 1/4-mile Widener Handicap, one of the most prestigious races in the country for older horses. What followed was something right out of Hollywood. His Majesty went to the lead and set testing fractions of :22 4/5, :46 1/5, and 1:10 1/5 while under pressure throughout. He then found another gear turning for home and opened a two-length lead at the eighth pole and looked to be home free. But, seemingly out of nowhere, here came Good Counsel charging down the stretch and closing the gap with every stride. Good Counsel pulled on even terms with His Majesty, and the pair drew off from the rest of the field. Through the final sixteenth, they were as inseparable as they had been in their paddock as yearlings. All that was missing was the wrestling. Here were two buddies who had grown up together and played together, sharing the same paddock for some seven months, in a desperate struggle to the wire. They hit the finish line as one, and it took a photo to determine that Good Counsel had just nosed out his more illustrious stablemate. The newspaper headlines the next day referred to them as Darby Dan’s Dynamic Duo. That was the last time they would meet in competition. His Majesty injured a stifle the day of the Hawthorne Gold Cup and was sidelined for five months. He suffered the injury falling in his stall, convincing Rondinello that someone had gotten to him. Rondinello said the colt, right before collapsing, was acting like he was drunk. During the time His Majesty was at the farm recuperating, Good Counsel won the Longfellow Handicap at Monmouth, then was retired to Darby Dan. His Majesty returned again the following year, but his hard luck continued. After setting a track record for 1 1/8 miles at Hialeah (1:46 2/5), he suffered a bowed tendon in the Donn Handicap, ending an ill-fated career that had once shown so much promise. His Majesty went on to become the leading sire in the country in 1982 and continued the Ribot line through his son Pleasant Colony, and Pleasant Colony’s sons Pleasant Tap and Pleasantly Perfect, not to mention Pleasant Tap’s sons Premium Tap and Tiago. Pleasant Colony and Pleasant Tap alone have won or sired the winners of the Kentucky Derby, Preakness, Belmont Stakes, Breeders’ Cup Classic, Dubai World Cup, Japan Cup, Irish Derby, Jockey Club Gold Cup, Santa Anita Handicap, Santa Anita Derby, Arlington Million, Woodward Stakes, Dubai Duty Free, and Breeders’ Cup Juvenile Fillies. 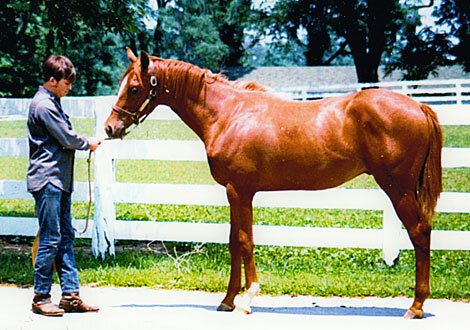 Good Counsel didn’t have much success as a stallion and died in 1987 of laminitis. The once grand-looking His Majesty eventually began to deteriorate physically and was barely able to control his bodily functions. In 1994, at age 26, he fell off a mare in the breeding shed, and it was obvious the end was near. According to John Galbreath’s grandson, John Phillips, who runs Darby Dan, he just lay on the ground for a while and looked up at him. Shortly after, His Majesty began to lose weight and became extremely weak in his hind end. The decision finally was made to put him out of his misery. I just happened to be in Kentucky at the time and went to pay His Majesty a visit, knowing it could be the last time I’d ever see him. What I found was an empty stall and a freshly dug grave next to the graves of Graustark and Ribot. I knew immediately that His Majesty, the horse I had followed from the day he was born and watched grow up with his buddy Good Counsel, was gone. His Majesty lies next to his brother and sire on a grassy area next to the stallion barn with a large headstone for all to see as they drive by. Good Counsel lies in the main grave site with a smaller headstone outside the yearling barn, just a few yards from where he and His Majesty had played together more than 40 years ago. 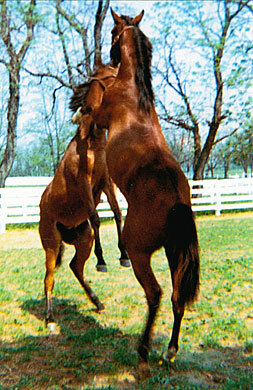 In 1972, I photographed two yearlings on the same day at Darby Dan. One was a Sea-Bird colt, later to be named Little Current. The other was a Graustark filly, to be named Cherished Moment. 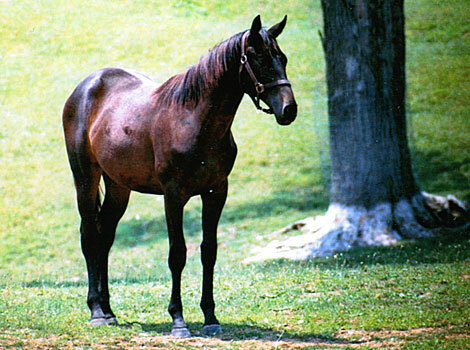 In 1980, Little Current, who would romp in the Preakness and Belmont and be named champion 3-year-old colt, was bred to Cherished Moment and produced a filly named Belle of Killarney, who would become the maternal granddam of Kentucky Derby and Preakness winner Funny Cide.